Add some fake blood and gore to this fun horror toy, give as gruesome Halloween or pirate birthday party prizes and fancy dress events. Looks real, great to fool your friends. 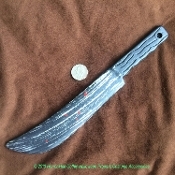 This flexible plastic bladed dagger toy knife is the perfect zombie or Dexter inspired serial killer costume accessory. This plastic knife is lightweight enough to carry all Halloween night and is also a great accessory for Halloween party haunted house decorations. Great steampunk Halloween costume accessories for any gothic, punk, biker, butcher chop shop, zombie apocalypse cosplay outfit. Lay your fake dead body or decapitated head prop, with the plastic toy dagger, out on your lawn spattered with fake red blood. Display next to other Halloween cut off severed body parts props, as a special gruesome touch. -Approx. 11.25-inch (28cm) total length x 3/8-inch (0.94cm) Thick. -Color: Black Handle with Silver Gray Bloody Red Spattered Blade.